Here at MyDriverLicenses.org, the experts strive to teach drivers about all traffic laws, as well as the technological devices used to enforce them. Red light cameras, for instance, have become common in most cities across the country. The cameras are usually placed at major intersections, and they photograph drivers who run red lights. Once a picture is taken, the offending driver will receive a ticket in the mail. After receiving a ticket or violation notice, the driver is allowed to decide whether to pay the fine or dispute the violation in traffic court. Most red light cameras are placed in metal boxes and attached to poles at strategic intersection locations. These locations are usually chosen according to the number of car crashes recorded at them, so intersections with few traffic accidents rarely have cameras. Electronic devices buried below the pavement measure the speed of vehicles and use a set calculation to determine if a specific vehicle will be able to stop on time. When the chosen car actually runs the light, the camera takes two separate photographs and sends them to a law enforcement database. Some red light cameras give drivers a “grace period,” meaning that drivers who run the light right as it turns red are not ticketed. Most violations occur within one second of the light turning red, and proponents of the cameras claim that the rate of violations have dropped by 60 to 80 percent in some cities because of their installation. Stricter states actually begin calculating stop times when the light turns yellow (such as New Jersey). The team at MyDriverLicenses.org has found that red light cameras are not welcomed in every part of the country. Over the last year, more than 12 states have designated certain areas as camera-free. In some states, such as New Mexico, the law prohibits cameras from being installed on interstates and state highways. In other areas, the camera must capture a photograph of the drivers face in order for the violation to be valid. Furthermore, numerous state supreme courts have ruled red light traffic cameras to be unconstitutional, claiming that they violate the privacy rights of citizens. 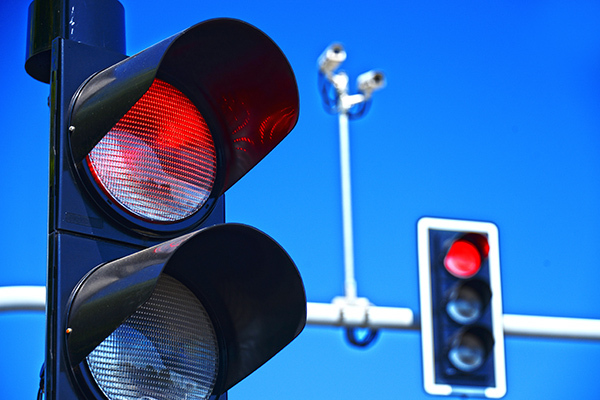 Statistically, red light cameras have reduced the number of collisions in the areas where they were installed. However, the number of rear-end collisions near these lights has increased significantly. Opponents of red light cameras point to the fact that some drivers feel pressured to make split-second stops to avoid being ticketed. Despite this rise in rear-end accidents, the overall number of crashes has decreased in almost every jurisdiction where they have been installed. Note: The team at MyDriverLicenses.org suggests drivers slow down when they observe a traffic light change from green to yellow. Adhering to this simple rule of thumb can prevent most unwanted encounters with red light cameras.